I'm not sure who demanded it or why, but we now have a sequel to the mediocre Nicholas Cage comic book movie GHOST RIDER. Sure, the original eventually turned a profit thanks to foreign markets and home video, but it was hardly a huge hit, and if the audience ratings on the Tomatometer are to be believed, customer satisfaction with the product was pretty low. 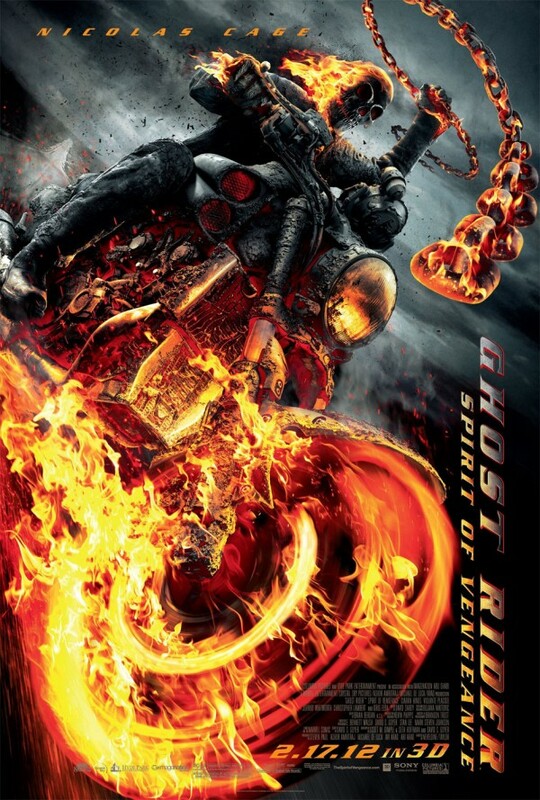 Nonetheless, we now have GHOST RIDER: SPIRIT OF VENGEANCE gracing movie screens. Cage once again plays Johnny Blaze, a motorcycle stunt rider who makes a deal with the Devil to save his father's life. In return, he has to play host to a demon with a flaming skull for a head who likes to snack on the souls of the wicked. Since most of us have at least a little evil inside us, the demon has a pretty extensive menu to choose from. We get a refresher on all this backstory in an animated flashback similar to the one in JONAH HEX, a film SPIRIT OF VENGEANCE directing team Neveldine/Taylor wrote the screenplay for and were originally supposed to direct until behind the scenes conflict led to a parting of the ways. Considering how bad HEX turned out, you can't blame them for wanting to recycle the device here. It's a good sequence that follows hot on the heels of an excellent action packed opening where warrior monk Moreau (Idris Elba) tries to protect gypsy woman Nadaya (Violante Placido) and her son Danny (Fergus Riordan) from a group of bad guys led by Nadaya's ex boyfriend Carrigan (Johnny Whitworth).Eventually Moreau tracks down Blaze and convinces him to come out of hiding and let his inner demon loose to help protect the boy, who is destined to be the antichrist if the Devil, currently in the form of a guy named Roarke (Ciarán Hinds) can get his hands on him in time for the obligatory ritual. Co-directors Neveldine/Taylor do their best to turn the lackluster and overly familiar screenplay by Scott M. Gimple, Seth Hoffman, and David S. Goyer (from Goyer's original story) into something as frenetic and over the top as their CRANK films, but ultimately it feels like something (most likely the producers) is holding them back. There are definitely scenes that bear the directing duo's distinctive sensibility and style, but far too much of the film is dull and pedestrian. Which is not to say that there aren't a few scenes that almost make up for the slow patches. Cage reigns himself in for most of the movie, but there is one top notch Hall of Fame freak-out that fans will want to see. And as usual, Neveldine/Taylor excel in the action sequences. They're one of the few filmmakers who can do super fast editing in a way that doesn't sacrifice coherency or obscure the action in a blur of shaky camerawork. It's not enough to warrant a full on recommendation, but if you're inclined to see this anyway I wouldn't try to warn you off. 2 1/2 out of 4 stars.